May I present David Phoenix, this week’s Designer Highlight of the Week! With twenty years of experience and growth in the industry, Mr. Phoenix has quite the reputation–and he should! He follows a true designer’s mindset in keeping the interest of the client present while adding the creativity he has become famous for. His designs reflect his mastery of juxtaposition, and you’ll find yourself wondering how two styles that are complete opposites can be used together in such a way. Mr. Phoenix was chosen as one of American’s Top Young Designers in House Beautiful, and his work can be found in Architectural Digest, California Homes, and in an upcoming issue of LUXE magazine. Here are some of my favorite designs by him! 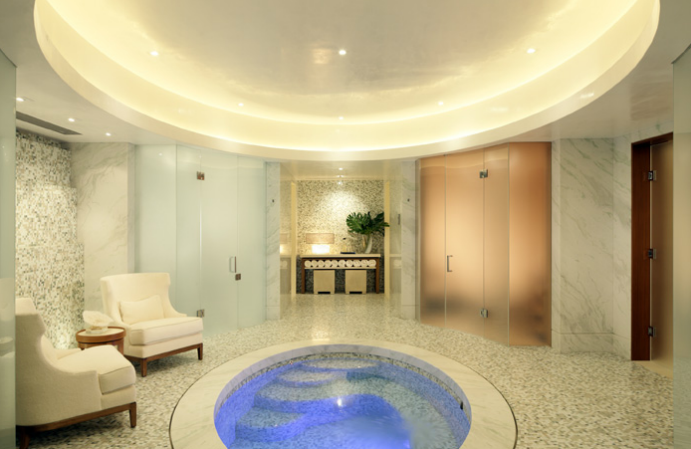 If I were to enter this amazing spa (found in one of his compounds) I would never leave! The first thing that caught my eye in this living room was the fireplace with the wall done in stunning small slate tiles. I love the use of wood on rest of walls against the tiles! Not to mention the gorgeous gold and glass cocktail table. Mr. Phoenix has created a living space that is earthy, warm, and very inviting! This home’s great room has a stunning stone wall and an unbelievable wood fireplace (with the TV framed in–such a great idea). 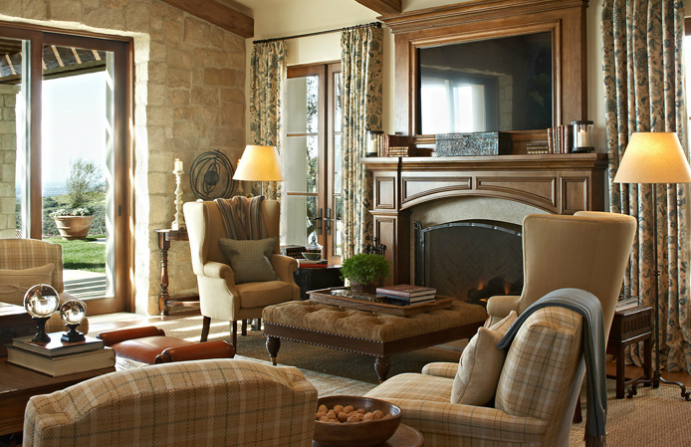 I adore the great wing chairs flanking the fireplace and that yummy (there! I said it) plaid fabric on the other chairs. This room just screams take me here for wine with friends! My nieces and nephews would be delighted to have a room like this to stay in! 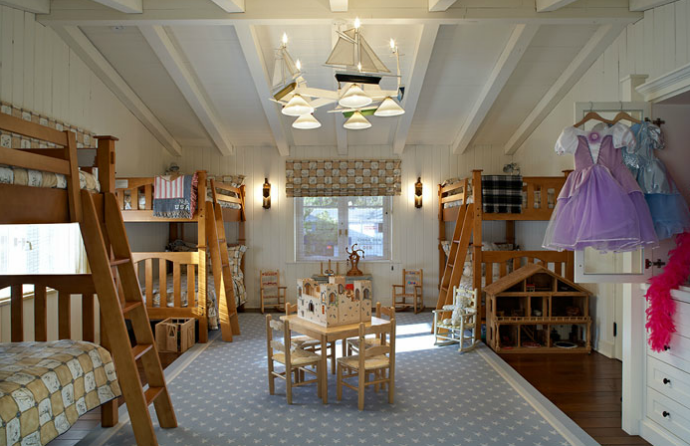 Mr. Phoenix makes great use of the space, with plenty of room for sleep and play. Of course, there’s a bonus: that lovely chandelier. He definitely does not have a shortage of clients that have diverse homes! 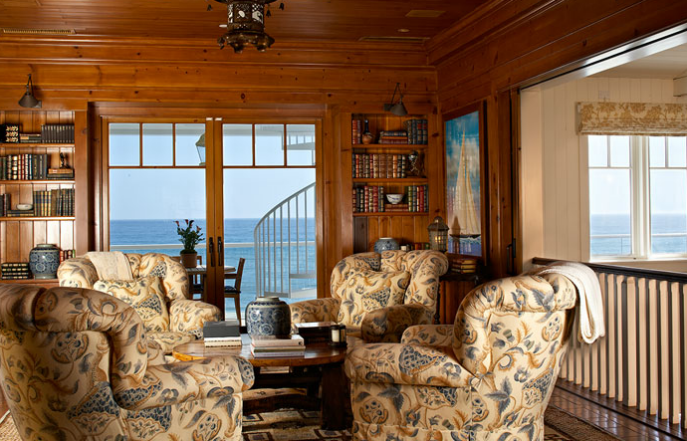 Overlooking the water, this sun room is the epitome of calm, warm and inviting. In this home by the water, Mr. Phoenix really showcases his art for juxtaposition. 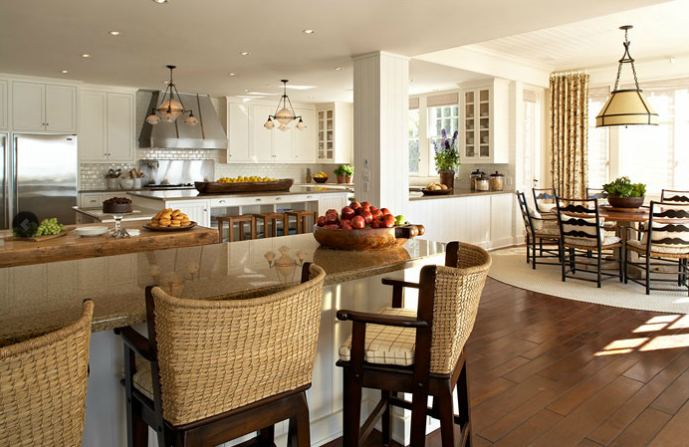 He uses a great mix of materials here for a beautifully designed kitchen and eating area. At a glance you can see his use of rattan, wood, stainless steel, and granite. Amazing! I know the fabric is a little floral for some men’s taste but I don’t think my man of the house would mind bringing his friends into this exquisite room for a cigar and a scotch! This house is so glamourous it should be in Manhattan! Mr. Phoenix creates a style that is altogether sleek, sophisticated and warm. He does something here that you don’t see very often: a contrast between the style of the outdoors (all those trees, it must be beautiful outside this house) and the indoors. If you would like to learn more about David Phoenix or see more of his portfolio, he has a great collection of his work on his website, www.DavidPhoenix.com.